A furious fourth-quarter comeback. A pair of game-extending shots that resulted in two extra periods. Monday afternoon’s Atlantic Division rivalry clash at Madison Square Garden fittingly featured all of the above. New York, however, was the last team standing, as the Knicks earned a 119-113 double-overtime victory on Martin Luther King Jr. Day. With 13 seconds remaining in regulation, the Sixers found themselves near the finish line. Ish Smith had just nailed a 22-foot jump shot to increase his club’s lead to 96-93. There was still enough time for Carmelo Anthony to have a say. Fresh off a two-game absence caused by a sprained right ankle, the 10-time All-Star buried a three-pointer with three seconds left in the fourth quarter, prompting the initial extra stanza. The Sixers shrugged off Anthony’s clutch shot to score the first four points of the first overtime, but New York managed to establish a three-point edge of its own, 107-104, with 20 seconds to go. 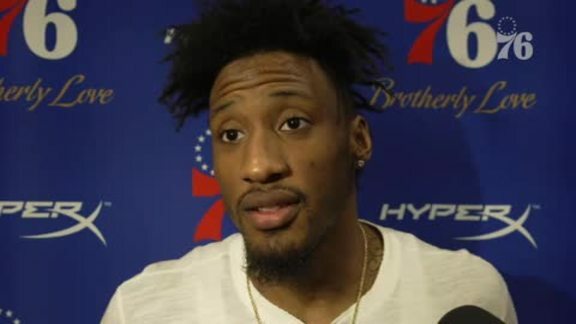 It was then Robert Covington’s turn to provide a heroic heave. He banked in a triple that resulted in yet another deadlock, and subsequently required an additional five minutes to be tacked onto the scoreboard. The Knicks made their move in the second overtime. Seasoned starters Robin Lopez, Arron Afflalo, and Carmelo Anthony partnered up with Langston Galloway, the second-year Saint Joseph’s product, for pivotal contributions that put the hard-fought tilt out of the Sixers’ reach. Late in the third quarter, the Sixers faced long odds to make a game of it against the Knicks. New York, having increased its edge to a game-high 18 points, held all the momentum. Brett Brown decided to bring in Isaiah Canaan, who quickly knocked down two triples. The instant energy he provided then seemed to rub off on his teammates, particularly Ish Smith and Nerlens Noel. The duo helped the Sixers outscore the Knicks 33-20 in the fourth frame, and would combine for 26 points the rest of the way through the two overtime periods. Smith finished with 16 points, and a personal-best 16 assists. Noel registered his 10th double-double of the campaign, posting 18 points and 13 rebounds. He also recorded three blocks. Jahlil Okafor paced the Sixers with 20 points, his 17th such game this year. Afflalo led all scorers with 25 points. Anthony tallied 19 points. Kristaps Porzingis collected 16 points, 12 rebounds, four assists, and three blocks, but didn’t play after the fourth quarter. There were 13 lead changes and 15 ties in what was the Sixers’ first double-overtime game since a December 3rd, 2013 126-125 triumph over the Orlando Magic. Aiming to seize control in the first overtime, the Sixers turned to the reliable lob-and-oop combo of Ish Smith and Nerlens Noel. The highlight below captures the fifth, final, and most resounding sequence in which Smith set-up Noel for a dunk on Monday. The deposit nudged the Sixers’ lead to three points, which proved to be their largest margin for the rest of the afternoon. "Brett Brown, in my view, is the coach of the year already because of how he gets his guys to compete. To me, that is why the game was never really over." Martin Luther King Jr. Day has become a signature date on the NBA’s yearly calendar. The Sixers and Knicks were two of the 20 teams that helped the league recognize Monday’s federal holiday. The significance, and responsibility, of such an assignment wasn’t lost on the contest’s participants. New York has hosted a King Day game at Madison Square Garden each year since 1987. Monday’s double-overtime thriller boosted their record to 19-11 on the United States’ most prominent day of service. Around the league, players gave fans a sneak peak of specially designed shoes and sneakers that will be rolled out in full force in February. Members of the Sixers and Knicks also sported gray “M.L.K.” warm-up shirts. Richaun Holmes entered Monday’s game with some personal momentum. Two days earlier, in the Sixers’ 25-point victory over the Portland Trail Blazers, the rookie deposited 17 points in 27 minutes. Prior to Saturday, Holmes recorded just three minutes in the Sixers’ overtime outing against the Chicago Bulls on Thursday. Before that, he didn’t play in back to back games as a result of being a “Coach’s Decision.” Recently, Brett Brown spoke to the 22-year old Bowling Green product about the ebbs and flows in playing time that occur over the course of an NBA season. Holmes kept his circumstances in perspective. Holmes put up two points and three rebounds in New York. He was on the floor for 13 minutes, the bulk of which came in the opening half. For one Sixer in particular, stops at the famed arena, which opened in 1968, are that much more meaningful. JaKarr Sampson spent his two years in college suiting up for St. John’s University. The Red Storm plays nearly a quarter of their schedule at M.S.G. Sampson made 18 regular season appearances at Madison Square Garden during his stint at St. John’s. In a February 2014 game against Butler, Sampson dropped a career-high 23 points. He had two points, two rebounds, and one steal on Monday. Warmer conditions await the Sixers at the second and final destination of their current road trip, as they head to Orlando for a 7:00 PM EST clash with the Magic (20-19) on Wednesday. Under first-year head coach Scott Skiles, Orlando has shown signs of improvement, positioning itself for a winning season for the first time in four years. After a 13-5 stretch propelled them a season-best six games over .500, the Magic have since fallen on harder times. Heading into Monday’s tilt against the Atlanta Hawks, Orlando had fallen in six of seven games. Nik Vucevic, now in his fifth professional season, tops the Magic with averages of 17.1 points and 8.3 rebounds per game. Victor Oladipo, who accounts for 13.5 points per game, was not supposed to play in Atlanta, due to a sore right knee.